Guardians superior ‘3 layer’ tanking system. Damp proofing and converting a damp cellar or basement can be a surprisingly inexpensive way of increasing living space and can substantially increase the value of a property. Waterproofed or tanked cellars and basements can be converted into kitchens, bathrooms, wine cellars, living rooms, gyms, studies, or even recording studios. You are limited only by your imagination. Tanking is generally used in the control of penetrating damp in earth retaining walls usually in waterproof tanking basements and below ground level. The symptoms are generally the same as rising damp, flaking plaster,a spongy soft feel to wall, white powder or crystals appearing on the wall and lifting and stained wallpaper. Unlike rising damp which will usually stop around a metre above ground level, penetrating damp can spoil the whole wall from top to bottom. Many damp proofing companies use a 1 layer or at best a 2 layer tanking system. Guardian damp proofing insists on using a superior ‘3 layer’ tanking system ensuring the best possible long term solution to penetrative damp problems. Why the tanking system and not Damp proof course injection? In earth retaining walls, vaults and many basements the problem is not that moisture is rising but penetrating from all around, thus a DPC would not be of any use as it only controls the flow of water through the wall by capillary action. Also the levels of moisture and hygroscopic/deliquescent salts are much higher than in walls suffering from rising damp, therefore the usual specialist re-plastering would not have the desired effect. Where walls below ground are affected by penetrative damp, the plaster and backing coats will need to be removed back to the brickwork. The substrate is then thoroughly cleaned and prepared. A waterproof coating (Layer 1) is then applied to the wall at a minimum thickness of 10mm until the surface is plumb and even. The cementitious tanking mixture (Layer 2)is then applied followed by a further render coat (layer 3) and left to dry. 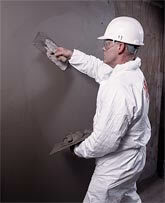 When dry the wall can then be finished with a multi finish plaster coat ready for decoration. At guardian damp proofing we tend to use a cementitious tanking System which has been a proven treatment in the control of penetrating damp for over 60 years and has become the industry standard. The other method used by ourselves is the cavity drainage system which consists of sealing all walls and floors with a plastic membrane and installing a pump to drain all water away. Once this system is in place the walls can be finished with plaster or dry lining. Which ever method used we give long term guarantees on both treatments ranging from 10-20 years. Caring for your home & the environment - Guardian only use the Greenest products available. Copyright © 2019 GUARDIAN DAMP PROOFING. Powered by WordPress. Theme: Spacious by ThemeGrill.